THE REVIEW: As dedicated readers of this site will know, I rarely give out a one star rating for a movie. In the previous 516 films I’ve watched, I’ve only awarded the honor to four films: Trumbo, Sleeping Beauty (1959), RoboCop, and perhaps worst of all Battle: Los Angeles. Adding to this company is a film so bad I seriously considered stopping the film less than twenty minutes into it. 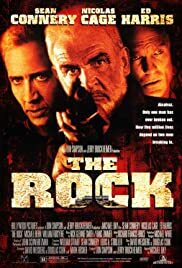 Much to my surprise as the credits rolled, I discovered that not only did Roger Ebert award this film 3.5 stars, The Rock is also Michael Bay’s highest ranked film on Rotten Tomatoes at 66%. As a filmgoer, there’s a few rules and practices you start to take for granted; a language so to speak for film. After a while you become fluent in the language and can start taking shortcuts to experiment with new techniques or telling your story in a different way. It’s ok for these rules to be broken and most often the films that stick with us for many years after seeing them are ones that deviate from a standard template. Transformers is a great example of a “template” film by Michael Bay. There’s nothing to special about it besides giant transforming robots that destroy cities in an attempt to save humankind. But it remains an entertaining film, a summer blockbuster that provides hours of entertainment every time you watch it. There’s a reason the Transformers series has lasted for four movies and grossed over $1 billion domestically. They’re not without criticism, of which I’ve provided plenty, but they can easily be classified as “watchable”. The Rock throws all of this out the window. From the first scene through the end credits, I was left shaking my head in bewilderment and confusion at the images flashing before my eyes. And that’s what every shot in this film is: flashing images. Quick, one-second close-ups and unnecessary push-ins and it feels like you’re watching some sort of brainwashing video out of A Clockwork Orange. The result is the viewer is left with absolutely zero sense of where scenes are taking place and how people are positioned. Often spatial awareness isn’t vital to filmmaking and editors can get away with some continuity errors of where actors stand, but in The Rock there is no such leeway. Pretty much the only shot in this film is a close-up or extreme close-up and all you see is people’s faces for two hours. Yes, there’s a (very small) handful of wide establishing shots thrown in every now and again (like Alcatraz or the San Francisco skyline), but these act just like stock footage clips. There’s nothing about the wide shots that really ties in with The Rock in particular, and so sparse that you barely even remember them. Just knowing that The Rock is about escaping from Alcatraz gives you all the setup information you need: San Francisco, island prison. I mentioned the push-ins on a great deal of shots which further emphasizes the problems I outlined. It’s one thing to give us a bunch of close-ups of actors. You could argue: oh, we just want to see everyone’s reactions and emotions while they deliver lines. But zooming in on every fourth or fifth shot just adds to the confusion. Even in action scenes, moments that Michael Bay is best known for and often benefit from fast-paced editing and tight shots, it is extremely difficult to follow the sequence of events that unfolds. In order to enjoy a big car chase or gun fight, you first must be able to understand what is going on. The Rock makes that nigh impossible. THE TAKEAWAY: All this focus on the editing and cinematography takes away from discussion on story, an element that’s notoriously bad and underdeveloped in Michael Bay films. For all I know, The Rock would have made for a great story and entertaining film had it not been for overwhelming technical issues that mar any enjoyment to be had. The premise of breaking into Alcatraz in order to stop a terrorist attack by Gen. Hummel (Ed Harris) is certainly intriguing. But when you want to stop watching a film after five minutes, something is seriously wrong. As great as it is to see Sean Connery play himself (pretty much), The Rock is utterly unwatchable and not to be recommended under any circumstances.